The next day, a large group of people gathered around the training grounds. They were packed so tightly together that it almost looked like they were in some sort of festival, as there were even food stands that were also set up around the area. A banner hung on the surrounding walls that read, “36th Tenkawa Cup.” The whole event was quite grand for just a mock battle, but school was probably out, and it seemed events like these didn’t come around often. Shino stood silently with his arms crossed in the waiting room. From what he could see, there were thirty-two other people in the room with him with about a fifty-fifty split on boys and girls. Everyone had chosen their own special weapon and were just waiting for the battle to begin. “… Hey, aren’t you Shinomiya?” he suddenly heard. He turned and saw a boy holding some sort of club in his hand walk up to him. It was Sugiishi, someone Shino had talked to before in class. “Well, peace out man. Good luck in battle, rookie,” said Sugiishi as he parted with the rest of the challengers. They all simultaneously pumped up their fists and moved out into the hall. Shino waited for most of them to leave before following them out. He walked out through the hall and finally into the entrance of the main area. Once he did, he was suddenly overwhelmed by frightening loud cheers from the crowd. It was so loud, in fact, that the whole atmosphere almost made him feel like he was in an ancient Roman colosseum. The area was called the training grounds, but with a circular, enclosed field and about 1,000 spectators waiting to see the battle, it certainly did not feel one. The spectators were getting impatient, and their cheers were only getting wilder as they continued to wait. “I see we got some good challengers, huh?” shouted a voice. With that, the audience shifted their attention away from Shino and the rest of the challengers onto a small figure standing on top of the arena walls. Trying to focus on the figure, Shino squinted. It was a girl with long hair, and the overcoat on her back was fluttering with the wind. In her hand, she was holding a huge sword that was probably as tall as her. This was, of course, Tenkawa Maihime. She stood majestically as she stared down the challengers. The Crowd. Went. Wild. Screams were pouring out from all around, and many were shouting her name from the top of their lungs. The cheers were so loud that it made their cheers before seem nothing but a quiet whisper, and the whole arena shook with their loud voices. Within the midst of the cheers, Maihime pumped her fist up and screamed out, shaking the arena even more. Shino, on the other hand, quietly marveled at her ridiculous popularity. Obviously, taking down the most <Unknowns> would make anyone a hero to the city, but even so, the crowd’s enthusiasm was miles beyond anything Shino had ever seen. It wasn’t anything unexpected though, as she had been dominant for around ten years now. It woudn’t even be an exaggeration at this point to call her a legend. She had truly become something more than just a fighter… she had become a symbol of Kanagawa. 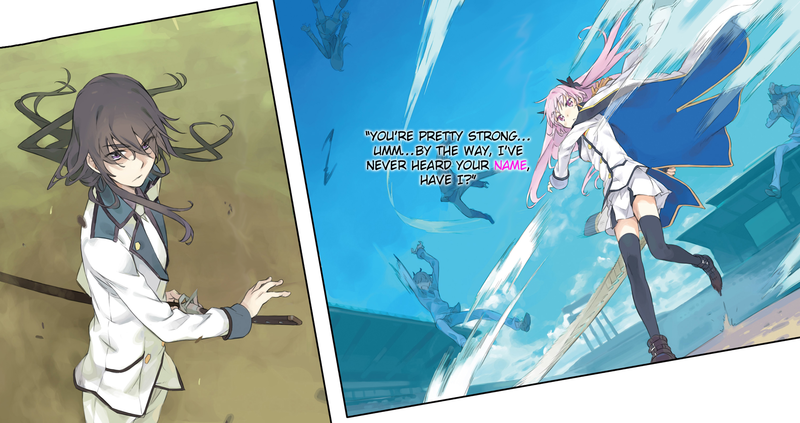 Maihime kicked off the top of the wall, interrupting his thoughts, and jumped elegantly toward the challengers. The wall itself was about twenty meters, and it was still another thirty meters to where the field was. Despite that, she did the jump so nonchalantly. Shino’s amazement didn’t stop there. The students around him started to focus on channeling each of their auras so they could materialize their own <Worlds>. By doing so, their consciousness drifted closer to the <Worlds> they dreamed about, and their powers began to appear. Using these powers, jumping the distance that Maihime just did would probably be no big deal to them as well. “AAhhh!” shouted Maihime. She lost her balance just as she landed, so her feet slipped and she face-planted straight into the ground. She stayed like that for a few moments as the crowd got uneasy. “…U-Ughh….” she groaned. She raised her head a little bit— tears were flowing in her eyes and her nose was beet red. However, she quickly wiped her eyes with her sleeves, sniffed her nose a few times, and stood up. “… I-I’m fine! !” she shouted triumphantly. The crowd went crazy once again! Maihime gave out the peace sign, and the spectators started to applaud. “… What is this…” This time, sweat dripped down Shino’s forehead as he squinted again. Funny enough, her nose was still red. Upon hearing that, however, the other students took up their weapons and got into their battle stances. The buzzer rang right after that announcement! In an instant, the first group of about ten people, all wielding their swords, spears, and axes, made a straight dash for Maihime. Their speeds were so superhumanly fast that they reached her in a blink of an eye, even though the distance was a good thirty meters. Using those weapons, they were able to materialize their <Worlds>, and all of a sudden the air was filled with traces fire and electricity. “YAHHHHHHHHHH! !” With a shout, Maihime swung her sword sideways. As a result, the students around her were all blown away like wind blowing away paper. A half circle was imprinted on the ground around her, and the students all went tumbling in different directions. A few were blown so far away that they even hit the wall around them. What resulted from that one blow was astonishing. About half of the group fainted, and the other half tried to get up, but soon collapsed on their knees. They stayed like that for a few moments before collapsing fully onto the ground. All ten were unable to continue battling any longer. “What the…?” Shino’s voice trailed off. He was at a loss for words. “NEXT!!! If you aren’t coming to me… I’m coming to YOU!” yelled Maihime. She gripped her sword with both hands and prepared to lunge out. “Go, go! !” yelled out another team. They charged Maihime before she had a chance to attack them. However, the result was the same. Even though they were so pumped up, Maihime just blew them all away again. “Wow… she’s amazing as always, huh?” Shino heard. He turned and saw Sugiishi standing next to him, club in hand. Sugiishi, with sweat dropping down his forehead, was also in awe staring at Maihime. “Well then, we go too!! !” he finally yelled. The remaining ten students around him yelled out as well and charged her. Tsk. Shino raised his eyebrows. He pushed his feet into the ground and grabbed his katana from around his waist. His plan was to mix in with the crowd and finish her off, but no way did he imagine Maihime to be this much of a monster. He noticed that once Sugiishi’s group was finished off, there would be no other students remaining. “Consider yourself lucky, Sugiishi, for you are about to find merit in your actions,” he whispered, turning his focus to Maihime. He took a small breath and used the back of his neck as a focus point. From that, he could feel the aura in his hands, legs, and eyes. His <World> was then materialized. It allowed him to reach anything in his field of view by being able touch it. Of course, this also applied to his katana, and with it, he was able to cut anything he saw in an instant. It was literally a way to kill long distance through sight alone. Shino continued to stare down Maihime. He turned his hips a bit and swung out his katana in one quick motion. Tachi Blade Art One: <Utsuhami>. A bright flash of silver emanated from his swing and left a beautiful trace of light. Shino knew that he swung at the perfect moment. He felt the blade go in for the certain kill. He had done this attack countless times before, so he knew when it succeeded. In that moment, Maihime opened her eyes even wider and thrusted her sword straight up. CLINK! The two blades made direct contact, and that feeling radiated all the way back to Shino. “Woah, what? ?” Shino stared in disbelief. In an instant, he felt his attack get blocked. What he threw out was no ordinary attack too… it was a shockwave that sliced anything in the blink of an eye. Knowing that, Shino thought that her block had to have been a fluke. Or was it? He started to doubt himself as his instincts were telling him something completely different. Which was it? He didn’t know. In any case, one thing was clear: Maihime was still standing strong. Shino’s attack created an opening for Sugiishi and his team to take advantage of, but even with that, it was no good. In less than thirty seconds, Sugiishi’s whole team was wiped out just like the rest of the students. Shino just stood there in a daze. Soon, with no one to fight her, Maihime turned her attention to him. She slowly walked towards him, dragging her sword along the way. Once she did, she looked up to him with her innocent eyes and smiled. “… Nah.” Shino didn’t actually know why he lied. Perhaps he just did it just because he felt like it. It was a pointless lie, but he tried to act dumb regardless. Maihime didn’t doubt his words one bit. “Really? I was mistaken? Oh…” she said as she frantically looked around. Her reaction was certainly unexpected. “Why don’t you trust yourself a bit more?” said Shino, sweating. “Huh? Ohh… so it was you!” She puffed her cheeks. Drawing her sword back, she took a step forward and got in position for a strike. Just from her stance alone Shino instantly felt an incredible amount of pressure, but that didn’t faze him as he held his sword in front with both hands. “Let’s do this,” he muttered. Maihime lunged at him the moment she heard that and went up for an upward slash. As she got closer, Shino noticed that her body was quite small, her sword not overly gigantic, and her killing intent nonexistent. He went up to counter the strike— the moment their swords made contact, he pushed her sword off a bit so it would miss him as it swung down. Even with that brief encounter, he could feel Maihime’s monstrous power. If he had taken that swing head on, he definitely would have been blown away like the rest of the students, and probably be unable to fight any more. Maihime was surprised that Shino actually defended himself from her attack. She let out a surprised gasp as she drew her sword back. Tsk. Shino squinted a bit just as Maihime’s next attack came, but Shino threw off that attack as well. She again attacked, and Shino again evaded. Attack. Evade. Attack. Evade. Attack. Evade. The cycle repeated itself many times. Shino’s <World> made it possible for him to keep countering Maihime’s attacks. From his aura, his eyes strengthened, so he was able to see even the fastest of movements. In fact, it was almost as if he was seeing the world, with Maihime in it, in slow motion. However, as the attacks went on, Shino’s eyes kept twitching. Her attacks were slowly chipping away at his katana, and his hands also started to get weary. Even though her attacks weren’t connecting at all, it was only a matter of time before Shino’s defense gave out. He knew this, so he tried to switch to the offense. Right before her next attack, Shino kicked up some dirt into her face, forcing her to close her eyes. He used this opening to draw his sword up and get her entire body inside his field of view. He saw her completely: her head, neck, shoulders, arms, everything. All in all, there were thirty-two vital spots on her body that he was completely focused on. If he was able to see all thirty-two spots, he would be able to cut every single one. With a thunderous roar, he swung down his sword. Tachi Blade Art 2: Senjin. From his sword, thirty-two simultaneous invisible strikes suddenly came at Maihime. Just as they were about to hit her, Maihime countered with a yell of her own. She spun her body around rapidly, almost like a tornado, and countered all thirty-two attacks. TINK TINK TINK!!! The sounds of two metals clashing together came out from inside the tornado, and for each clash, sparks flew out in all directions. Shino couldn’t believe what he was seeing. “What…?” he said with his eyes wide open, staring at her. He was dumbfounded… She couldn’t even see with the sand in her eyes, yet she sensed and successfully blocked every single one of those slashes that came from all around her. Maihime stopped spinning and jumped a bit back. She rubbed her eyes until she was able to see clearly and pointed her sword at him. She may not have taken any damage herself from the attacks, but it seemed even she couldn’t perfectly deflect them all. Parts of her uniform were ripped, and there was even a big hole in her outer coat. Despite that, she looked unfazed as she lightly tapped her skin through the newly made holes in her uniform. She turned to look at Shino and enthusiastically said, “Amazing! Hey, hey hey…. What was that just now? How’d you do it?!? !” She waved her arms around like a little child. “Umm… Not sure, I just did whatever, I think!” she said triumphantly. Shino was speechless. For some reason, he started to sweat more as well. “Akira Shinomiya,” he responded, still staring straight at her. “Ah, so Shino, huh?” Interestingly enough, she gave the same nickname that Hotaru once gave to him. Perhaps they were alike in some way. Shino didn’t respond. Maihime made a huge grin and took a step forward. “My turn then, Shino,” she said, getting her sword in position. Once again, Shino didn’t say a word as he took up his own fighting stance. He wasn’t trying to copy her, but somehow he knew that she wanted to finish the fight with her next attack. Still, no matter how much praise she sent his way, Shino knew that in the end, Maihime was certain of her own victory. Bring it on, then. Shino knew all too well how much of a monster Maihime was, but there were still some tricks he had up his sleeve. He sheathed his katana, grabbed the handle, and faced her with a low stance. Just from looking at his stance alone, it was clear that he too was ready for a head on strike. Maihime got so excited looking at him that her eyes were shaking with anticipation. The distance between her sword and his katana was about ten meters. He started to zone out the crowd around him as he focused more and more on her. In fact, he was so focused that nothing could have broken his concentration. A single drip of sweat rolled down his chin. It continued to drop, and drop, until it hit the ground. That’s when all hell broke loose. In that very instant, Maihime lunged at Shino at a frightening speed. Despite that, Shino’s superhuman vision was able to read her movements, and while she was in midair, he started to grip his handle harder and harder… He was ready to do it. BEEEEEEEEP! An alarm suddenly rang throughout the entire city. The two’s battle was forcibly stopped by its loud shriek. Tsk. Shino lost focus and dropped his attack. The alarm continued to ring, and this time an announcement came on as well. The city’s atmosphere changed in a split second. The spectators, who moments earlier were cheering their hearts out, suddenly turned quiet and quickly moved out of the arena. Shino didn’t respond. Obviously, they were like that because of her, but Shino chose not to say such a thing. She then leaned her sword against her shoulder and took off. Using the power strengthened by her aura, she was able to easily jump onto the wall that surrounded the area. “…ATTENTION!” she shouted, pointing her sword towards the ocean. Her voice echoed loudly off the walls and into the ears of the students. They too turned to the ocean. In just a few sentences, Maihime managed to rally up the students, who before were completely scattered about. “…Off to save the world we go then!” she finally said nonchalantly. She did a big leap off the wall towards the ocean, and the students soon followed suit. Shino went to follow her as well. Once he left the arena, however, he randomly stopped and stared out into the ocean. “Y-Yeah… I’m fine,” he said without turning to look at her. “… I don’t know,” said Shino after a brief pause. Right as she said that, ominous silhouettes appeared on the ocean horizon. They were obviously the <Unknowns>, and from the looks of it, they were probably going to invade the city. A vertical flash of light suddenly appeared in the front lines and split not only the ocean in two, but also the group of <Unknowns> above it as well. After a few moments, the two were able to feel the shockwave that emanated from that very light. Shino couldn’t confirm it, but he knew… He knew that the light that had just appeared and shook the earth itself was the result of Maihime getting serious. Hotaru was speechless. She could only watch as she started to get more and more nervous. I don’t understand the left part. Help me please. as always i cant thank you enough for the translation . any way hope to hear from you soon. I do the translation, editing, and proofreading by myself so there’s definitely mistakes, so it’d be great if you can help out! If you have the time I’d love to hear some feedback. one last thing i just wanna be sure dont get mad at me for asking but you include illustrations in your translations too right? Many Thanks! I love you! As a translator who’s doing Godly work for lowly leechers like me, I mean. And as such, I feel like spreading this. So, would you mind me sharing this on every platform available to me? Reddit, Facebook, Blog, Twitter, Tumbler, Google+ because why not, and perhaps more? If yes, would you prefer doing a “synopsis” yourself or can I just copy the one from MAL? Sure, absolutely; Thanks so much! Or not if it sounds a little off :) Up to you! As a lowly leecher, I want to spread the hard work of all the Translator-sama that allow us non-Japanese speakers read these wonderful tales. So, my sincerest thanks, and I hope you get the attention you deserve! Thanks you so much for translating :) I looking forward for more.